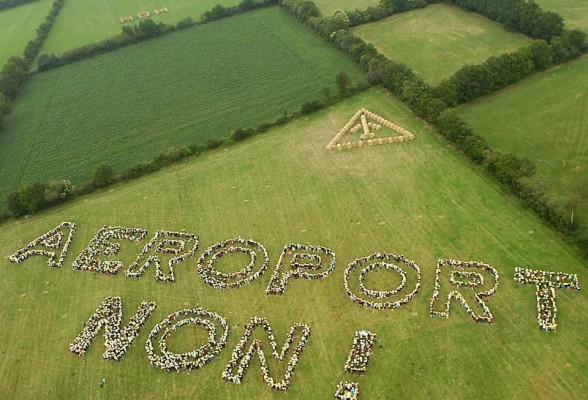 AirportWatch | Notre Dame des Landes. The ZAD. One person’s account of what is going on and why. Notre Dame des Landes. The ZAD. One person’s account of what is going on and why. 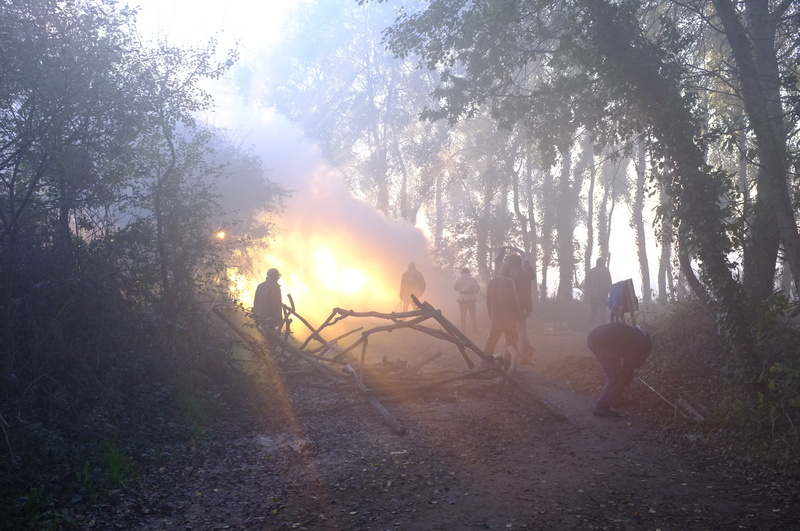 This is a long, personal account of what is going on at Notre Dame des Landes, by someone there with the anti-capitalists who are fighting the police and the authorities to defend the site. Vinci want to start work on the new airport and the roads for it by the end of November. The activists hope to take back some land on 17th November. The anti capitalists have moved in to fight with the local people and local farmers who have had their land expropriated for the airport work. This account is long, but makes a fascinating read, revealing the passion and determination of those fighting this development – which they see as hugely socially and environmentally harmful. 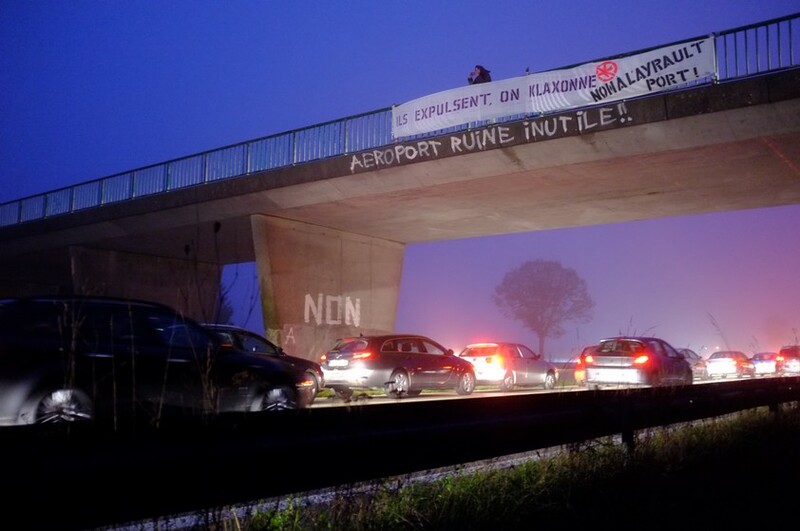 Extracts from a long article at http://labofii.wordpress.com/2012/11/13/rural-rebels-and-useless-airports-la-zad-europes-largest-postcapitalist-land-occupation/ about the Nantes airport struggle. We have entered La ZAD (Zone A Défendre) – Europe’s largest postcapitalist protest camp – a kind of rural occupy on the eastern edge of Brittany, half and hour’s drive from the city of Nantes. Like a rebel constellation spread across 4000 acres of forest, farmland and marshes, it takes the form of old squatted farms and fields, DIY strawbale houses, upcycled sheds, theatres and bars cobbled from industrial pallets, hobbit like round houses, cute cabins built with the world’s waste, huts perched frighteningly high in trees and a multitude of other disobedient architectural fantasies. La ZAD has been a laboratory for ways of living despite capitalism since the 2009 French Climate Camp. At the camp activists and locals put together a call for people to come and live on the Zone to protect it. Now you can find illegal goat herds and organic bakeries, bike workshops and bee hives, working farms and communal kitchens, a micro brewery, a mobile library, and even a pirate radio station: Radio Klaxon. Emitting from a secret location somewhere in the Zone, the station hijacks the airwaves of “Radio Vinci Autoroute” the traffic information channel run by Vinci for its private network of French motorways. The world’s largest multinational construction firm, builders of nuclear power stations, African uranium mines, oil pipelines, motorways, car parks and the infrastructure of hyper capitalism everywhere, Vinci also happen to be the company commissioned by the French government to cover this landscape in concrete and open Nantes new airport (it already has one) by 2017. Well that’s the plan. Inside the barn, hundreds of people mill around, there are grey haired pensioners, farmers in muddy overalls, a sprinkling of hippies, folk in black hoodies adorned with headtorches and more than a handful of dogs. Food is being cooked and people are browsing the largest “free shop” I’ve ever seen (a space where there is no monetary exchange). Long tables bend under piles of clothes all sorted neatly and signposted: jumpers, trousers, rain jackets, boots(with boxes for different shoe sizes) there is even a box marked dirty socks under one filled with dry ones. Locals from the nearby village of Notre-Dames-des-Landes wash the socks regularly. Another table has mountains of medical supplies whilst the kitchen is drowning in pasta. Supporters from the four corners of France have donated all this material over last week since the evictions began. 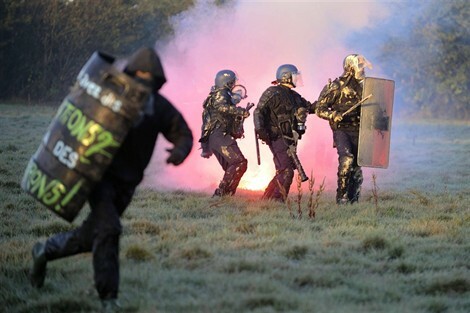 On the 16th of October 1200 riot police overran La ZAD. What had been a state free autonomous zone for 3 years was transformed within a few hours into a militarised sector. Road blocks sealed the area, Guard Mobiles (military mobile gendarme units) swarmed everywhere and bulldozers groaned across the fields. Despite resistance from the Zadists within two days the state had destroyed 9 of the 12 of the squatted spaces. On one of the days, 250 rounds of tear gas were fired into the market garden, seemingly to contaminate the vegetables that until that moment had fed over 100 Zadists every week. A principle of war is of course: cut off the supplies. In the afternoon lorries guarded by convoys of riot vans carried away every sign of habitation – every lump of rubble or shard of broken furniture, smashed crockery or child’s toy – everything – nothing remained but mud and the scars of bulldozer tracks. This act of erasure was not only to make sure that the wreckage would not be used to rebuild the houses, but more importantly to wipe out all traces of history. Ruins hold memories and stories; and a principle of resistance is that stories stoke struggle. As these words left his lips the images of an elderly woman collecting teargas canisters from a vegetable garden, ancient farmhouses being torn down and farmers pushed around by riot police were circulating across the country and seemed to be touching a nerve. Ayrault has promoted the project as a “green” airport. It is planned to have living roofs covered in plants, the two runways have been designed to minimise taxiing to save on CO2 emissions and an organic community supported box scheme is meant to feed its employees. Next year Nantes will celebrate its latest award: European Green City 2013. To call this double speak is generous. According to a recent report a hundred million people will die of climate driven deaths over the next eighteen years. 80 percent of the slaughtered will be in countries with lower emissions. The Climate Catastrophe is not just a threat to our ecosystems and the species we share the biosphere with, it’s a violent war on the poor. A war whose weapons are built out of steel and concrete, tarmac and plastic, a war with a ticking methane bomb hiding under the artic. Waged by the logic of growth and disguised as everyday life according to capitalism, climate change is the war that could end all wars and all life with it. Calling an airport green is as cynical as calling a concentration camp humane. Perhaps in the future if we are lucky enough to have one, descendants will contemplate the ruins of airports as we do the sites of 18th century slave markets and wonder how a culture could have committed such barbarity so openly. Last time I was here in this beautiful strawbale home made entirely from the waste of the world it had a working bakery (supplying man ZADISTS and neighbours with daily organic Bread) and an abundant Permaculture garden. With the threat of expulsion the baker moved his oven to a safer (legal) space nearby and the other inhabitants including Katell, who teaches in the local primary school, took everything of value to the safe house. Now Les Cent Chenes (the 100 oaks) is a ghost of what it was and has been handed over as a collective sleeping space for the activists that have streamed in over the last days, from across the country and abroad, to put their bodies in the way of the evictions. We sleep here to be at hand when the police arrive at the Le Sabot nearby, which is still holding out. Le Sabot is the market garden now contaminated by CS gas. It was born in the spring of 2011, when over a thousand people armed with spades and seeds coordinated by the international radical young farmers movement Reclaim The Fields, occupied a couple of acres of land in the centre of the Zone and overnight turned it into a functioning vegetable farm. It has its own two-roomed cabin, a polytunnel, solar shower and now a ramshackle penthouse on the roof, to climb onto in case of expulsion. Merging resistance and tangible alternatives, Le Sabot reflects the postcapitalist politics of refusing to separate critique and construction, the yes and the no. We build barricades until sunset. Ishmel has managed to get hold of the old set that the Nantes Opera House were throwing away, it happens to be from an opera about the holocaust. The massive wooden panels make perfectly surreal barricading material. Since the evictions began the art of building barricades has taken over everyday life here. Everywhere you go there are little teams busy hauling materials across fields to erect another barricade. The idea is to slow the advance of the authorities, who have named their operation “Cesar” (Caesar), perhaps a reference to Obelix and Asterix’s resistant gallic village. The police have taken the weekend off and so barricade building takes place unhindered. Now there are ones rising on the main roads as well as the green lanes. 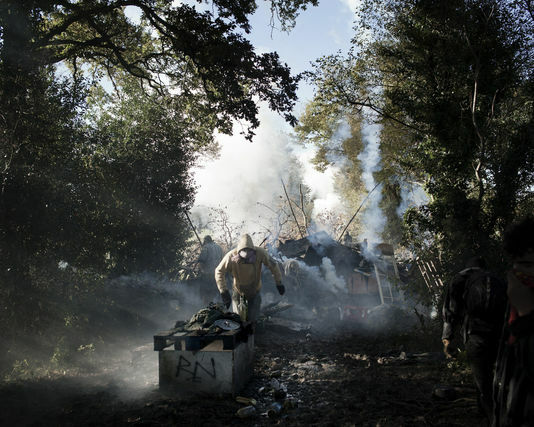 The multiplicity of different barricades reflects the different cultures at La Zad. Those living in tree houses in the Rohanne Forest have asked people not to cut living trees to make them, whilst in another part of the Zone a team of chainsaw wielding activists are tacking down oak trees and tangling steel rope in them. On one crossroads there are at least 20 barricades. There are huge hay rounds with cans of petrol beside them ready to set alight when the police attack, there is a steel wall of sitex – Anti squatting panels normally placed on doors and windows of empty houses –carefully welded together and one made from dozens of bamboo poles sticking out of the tarmace decorated with bicycle wheels. In the middle of it all there is makeshift kitchen with its mobile pizza oven made from an oil drum. An affinity group armed with cordless angle grinders and pick axes, have been working day and night to cut out giant trenches in the roads – in some cases several metres wide and deeper than a standing adult. Ishmel tells me that yesterday road agency workers came to mend one of the smaller trenches (not surrounded by barricades). People talked to the workers, trying to persuade them to turn around and not do the dirty work of Vinci. Despite having their boss on the phone coercing them to keep going, they eventually turned around and left the hole in the road. One of the workers later said “ What troubled me most was that I’m from around here and (clearing the barricades to allow the police to circulate) feels a bit like I was helping demolish my neighbours house.”There have also been stories of local police officers that refused to join the operation. The crisp autumn sky swarms with stars. A full moon throws shadows of gnarly oak trees across the fields. We end the evening in Le Sabot, dozens of us sitting around the wood burning Agar to eat a delicious Dauphinoise (a hot pot of potatoes and garlic) garnished with freshly picked Cepp mushrooms. Radio Klaxon plays in the background as always: “We have some news: 15 more cop vans have been spotted on the motorway driving in this direction”. There are already 30 parked up for the night in the aptly named Disco Paradiso nearby, it seems the second wave of “operation Ceasar” may well hit tomorow. Laura, who has been on walky-talky all day to coordinate the defence, picks up a piece of chalk and on the blackboard which used to be where the dates for planting and harvesting crops were written up; she scrawls angrily: NON! (NO). “They are coming!” Laura shouts! The cabin empties except for Marie, grey haired and in her sixties, who continues cooking un phased by the news of attack. Through the mist the glint of dozens of riot shields can be seen advancing down the lane towards Le Sabot. Time speeds up: the barricade is set alight, huge flames cut through the dawn light, we hear the sharp crack of tear gas canisters being shot at us, rotten vegetables, paint bombs and stones arc into the sky. I see Gwen running through the field holding one of the shields he has lovingly made: “Be careful you are walking on our beetroot,” it says on it. For a moment we can’t tell what is CS gas and what is morning mist, then our skin begins to scream in pain, Ishmel passes us lemon juice. The boom of concussion grenades being fired several kilometres away thunders across the plateau, Radio Klaxon tells us that they have attacked the forest simultaneously and are trying to take people out of the trees. We hear the sound of the samba band in the distance. We follow the rhythm to try and meet up with it, weaving through fields and hedgerows to avoid the roaming riot police. We pass through a field of high corn, several tractors and a huge harvesting machines are ploughing through it. For a minute the image of normal agricultural life taking place a few hundred metres from burning barricades and flying rubber bullets seems incongruous, but then we see that it’s Sylvain Fresneau driving the machine. Fresneau is one of the 100 local farmers who are due to be expropriated. He has refused to be bought off by the state. On the lane next to his field there are a thirty tractors flying the Confederation Paysan flag (Independent peasants union) backed up against a line of riot police. The tractors were meant to have reached Le Sabot in solidarity, but got blocked here. It seems however that they have at least managed to allow Fresneau to harvest his silage. For Fresneau to simply do his everyday job on this land is an act of resistance. We finally meet up with the samba activists. They have marched across the fields to the side of the Zone where bulldozers are clearing barricades off the roads and the relics of rural rioting litter the tarmac. We follow the band into the nearby forest where they play under the tree houses, the police haven’t got here yet. Like a nimble tree sprite Natasha glides down from her platform. Rolls of rope and jangling karabiners hang from her climbing harness. Someone on the ground below has just picked a mushroom and is wondering what species it is. A professional botanist, Natasha immediately identifies it: “ it’s a Russule – super tasty!” she declares before climbing gracefully back up into her towering tree. More than anyone she is aware of how ecosystems are networks of complementary relationships, constantly in the process of becoming more complex and diverse. She understands the unity in diversity that makes up the rich interdependent webs of life within this forest and is horrified by the cultural vacuum that wants to annihilate it. There have been similar cultures, cultures out of touch with their ecologies and sticking to entrenched beliefs. They all wrecked their life support systems and eventually collapsed. Robbing the future to pay the present was the hallmark of every civilisation whose ruins now scatter the deserts. 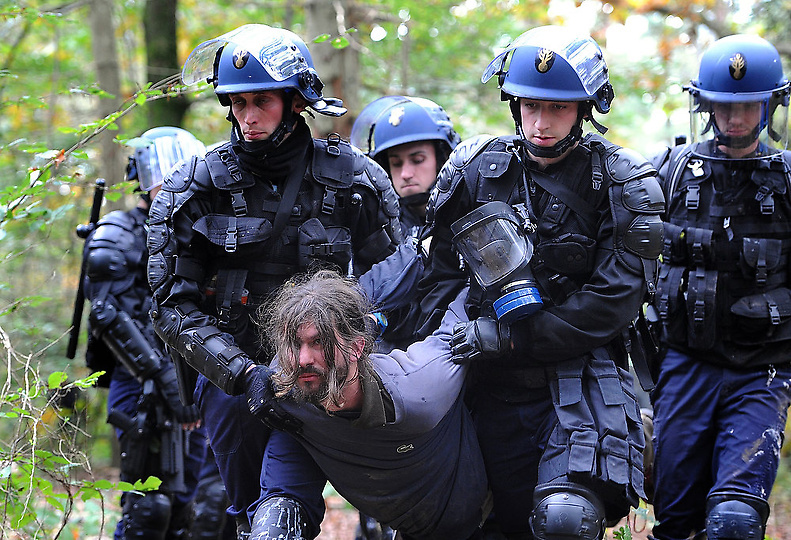 The government has said they want to “cleanse” La Zad before November 2012, so that they can begin the archaeological surveys and ecosystems services swaps. By law the headlands of all watershed should be protected and for every wetlands destroyed two have to be created elsewhere. Vinci however, is trying to challenge these laws in court, the verdict will be heard next month. If the ecosystems services project goes ahead it plans to move newts from twelve marshes to a new habitat. It’s the twisted logic of capitalism that thinks that you can swap one ecosystem for another, a market mindset where everything has become a commodity – a thing devoid of context. It’s the final gasps of a culture that has forgotten that our world is made up of relationships and not things. The state assumed that by destroying the Zadists houses and gardens they would demoralise the movement. They thought it would collapse when its material base had been removed. But quite the opposite has happened. “Our home is not the cob walls and hay bails, the bricks and mortar,” says Sara, whose house was raised to the ground last week, “but the land and the neighbours and its those connections that have been strengthened during the evictions”. It’s not just the friendships between activists on the barricades but also the complex relationships between the Zadists, the locals and farmers that have evolved. “It’s been a roller coaster over the years,” Sara continues. “ There have been strong moments of togetherness but many of mutual misunderstanding and mistrust. Not only did Sylvain Frenau’s open his barn as an HQ for everybody, but the ACIPA has set up a daily meeting point to bring newcomers into the Zone to resist the evictions, farmers and locals have stood as human shields between the masked activists and the riot police, whilst other have helped build barricades with their tractors and loaned out chain saws. The French state and media has tried undermine exactly this kind of sharing and support over the years by labelling the “ squatters” as members of the “Ultragauche” (the ultra leftists). A mythical term invented by a neurotic government Les Utragauche has been used to criminalise anticapitalist antiauthoritarian movements and throw the shadow of terrorism on to anyone influenced by the so called: “insurrectionist sect” that wrote the now infamous, and according to right wing U.S TV anchor Glen Beck “evil” book – The Coming Insurrection. The term is a weapon of repression used to divide the “good protesters” from the “bad” and to prevent diverse movements arising. What the government can’t control is a movement where farmers ploughing and planting monocultures are rebelling side by side with Permaculturists who practice no dig gardening, where older trade unionists sit in meetings with young anarchists who demand an identity beyond work, where libertarian communists teach pensioners how to forage wild foods and Anti civilisation vegans are lent tools by dairy farmers. It is the dynamic diversity of ecosystems which keeps them strong and resilient to shocks, movements that find unity in diversity are much harder to destroy than houses and forests and the new socialist government knows this. The discourse has expanded too. Many now see the choice to build an airport as yet another symptom of a system totally out of touch with reality. It’s a choice from another age, an age where climate change and peak oil were not yet threats, an age where the ideology of infinite growth was all that defined progress, an age where people talked about economic crisis rather than the economy as crisis. It seems that what is touching people is the destruction of ways of life that refuse to be part of such an antiquated society. It is the farmer’s firm stand, risking everything so that they can continue to produce food from their land that moves us. It is the Zadists’ simple lives, lived according to their passions and their needs that gives us glimpses of the future in the present. These things make so much more sense than a new airport built for political ego, corporations and profits. And now the story is no longer just about an airport, but about making the choice to oil the suicide machine wrecking our future or becoming its counter friction and opening new visions of what it means to live. A year ago, the Zadists put out a call for a day of Reoccupation to take place four weekends following the anticipated evictions. They asked people to come with hammers, planks and pitchforks, to reoccupy the land and build. 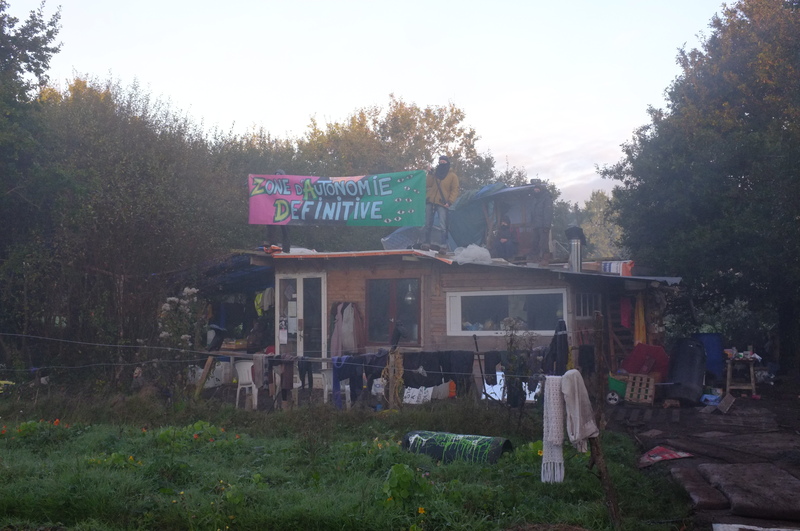 When they wrote the text little did they realise that the evictions would have transformed La ZAD into a household name. The date has been set for the 17th of November. Every Tuesday for the past three weeks 150 people have packed out a hall in Nantes to plan the reoccupation. There are groups of local architects and carpenters busy designing a meeting house; mass catering kitchens from across Europe are preparing food for thousands; 200 tractors are being mobilised; farmers, artists and activists from the Morbihan are planning a toilet and shower bloc complete with cacapult; a kit house is due to be brought 800 km from Dijon and there are even rumours that someone wants to build a “special” tower in the field where the control tower is planned. Posted: Wednesday, November 14th, 2012. Filed in General News, News about Airports, Recent News.